What do the terms CCFL, LCD and LED mean? 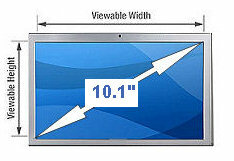 You may have heard the terms LCD and LED used when vendors refer to replacement laptop screens. This article sets out to explain what these terms mean and how to choose when confronted with an LCD or LED screen for the same laptop computer. What is meant by LCD, CCFL and LED? In actual fact the term LCD is slightly misleading, as almost all replacement laptop screens on the market today are LCD. LCD simply refers to the technology (Liquid Crystal Display), that is used to create the pixels (or dots) of the display that make up the entire image. In truth, screens are either CCFL (commonly mislabeled as LCD) or LED. The terms CCFL and LED refer only to the backlighting technology within the laptop screen. The pixels make up the display picture, from millions of "dots", either red, green or blue, and the backlight simply lights the screen so you can see the picture. CCFL screens use a miniature flourescent tube to light the screen, LED screens use Diodes, or LED lights that consume far less battery power. CCFL screens using this flourescent tube technology also require a ballast, like any flourescent lamp. This ballast is called a Power Inverter and usually sits directly underneath the screen. When purchasing a replacement screen, it is of course important to purchase the correct if multiple choices are present. Most reputable laptop screen suppliers will list both types of screen as CCFL (LCD) or LED. 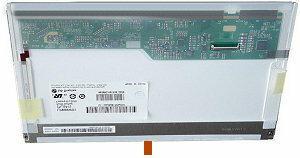 These types of laptop screen have wires coming from one bottom corner, which have one or two white plugs attached to be inserted into the right hand side of the power inverter. 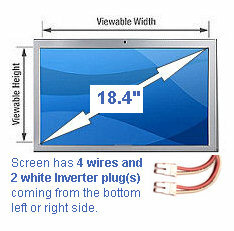 A 13.3" screen that has one CCFL backlight, the white plug attaches to the power inverter. 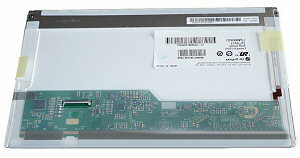 This is the back of a typical CCFL (LCD) laptop screen, the arrow points to the cable and plug for the power inverter. 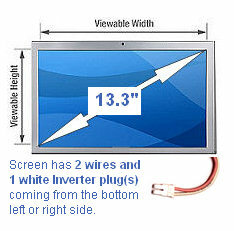 An LED screen has no white plug from the bottom and does not require a power inverter. Notice no white plugs coming from the bottom. Some LED screens have a filament cable (2nd image below, orange) that attaches to electronics but this is NOT an inverter. 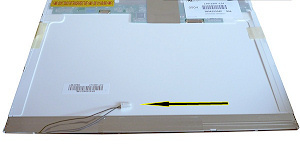 The rear of a typical LED laptop screen (may differ greatly from your specific model but for example only), notice no wires and no white plug from the bottom. This LED screen does not use a power inverter either, and has no wires with a white plug attached from the bottom, however notice the flat plastic orange cable coming from the bottom. This is known as a filament cable. Do not confuse this with the Inverter cables and plug. This screen is still an LED panel. How do I know which screen I need? You do not have to completely remove the laptop screen from the lid of the computer to determine which type is fitted. Most often all you need to do is remove the screen bezel, or the plastic surround (frame) around the screen. This is usually held in place by screws in the corners and sometimes middle of the screen. These screws can be covered by plastic washers that are removable with a sharp knife. Once the bezel is removed you will be able to quickly see if your screen has this white plug connected to an Inverter below the screen. Changing from one technology to the other, for example upgrading a CCFL (LCD) laptop screen to an LED laptop screen is not possible. For this reason you will have to replace like for like technologies within the machine. Why are there two types of screen for my laptop? LED technology has been in use within laptops for many years, however historically these types of laptop screen were always fitted to high end laptops such as the Fujitsu Lifebook computers. In recent years the laptop manufacturers have turned to using LED screens as standard, as they are able to offer portable devices such as laptop, notebook and netbook computers with relatively long battery lives. The reason one laptop model may have both types of replacement screen advertised for it is that the manufacturer has used the same model name over many years, and as such some models will have the older CCFL (LCD) screens fitted and newer models the LED screens. Usually changes to the screen LCD cable and motherboard are made to accomodate this, hence upgrading is mostly not possible. Is the CCFL inside the screen? Or is it attached outside of the screen? Hi Gordon, its a mini fluorescent tube like the ones in your house but very small, and thin. It is fitted along the bottom of the screen in the framework. Some screens (rare) also have one at the top and are called dual lamp. Do you know were to buy only the mini fluorescent tube for the Medion Akoya P8610? I have got a Dell Latitude 400 that requires new backlights. I have replaced the inverter to no avail. I am finding difficulty in getting new backlights or screen. Is it completely obsolete , or are there still backlight/ screens available? Will they be available in future? I don't know your original screen model number so you will need to check that but the above backlight should fit the panel in your laptop.